331(7 March 1945), 332, 334, 338, 339, 340, 346, 348, 350, 351, 352(A), 355, 356, 357, 358, 360, 362, 363, 364 (25 April 1945). (A) Non-Credited aborted mission -- For Mission dates, targets and Mission Reports, see Combat Missions. 2Lt Rudolph L. Griffith, Jr. (P) - First mission (331) flown as CoPilot with Combat Orientation Pilot 2Lt Harry E. Nester and his crew. All other missions flown as First Pilot. 2Lt Lawrence S. Smith (CP) - Stood down on mission 331. Flew on four missions with 2Lt Griffith crew (332, 334, 358, 339). Flew on seven missions as CoPilot with other Pilots (340, 341, 342, 344, 346, 352, 354. Flew as CoPilot with 2Lt Neil E. Cunningham as Pilot (353, 362). Upgraded from CoPilot to First Pilot. Flew five missions as First Pilot with 2Lt Neil E. Cunningham as CoPilot (355, 356, 358, 359, 360. Completed 18 credited combat missions on 17 April 1945 (Mission 362). F/O Joseph Besharian (N) - Stood down on mission 331 & 358. Flew on all other 2Lt Griffith missions. Completed 16 credited combat missions on 25 April 1945 (Mission 364). F/O Fortunato G. Correale (B/N) - Stood down on mission 331 & 346. Flew six missions with 2Lt Griffith: As Bombardier (332, 334, 338, 339, 340); As Navigator (358). Flew on eight missions as Navigator with other Pilots (348, 349, 350, 351, 352, 355, 361, 364). Completed 14 credited missions on 25 April 1945 (Mission 364). Sgt Warren J. Wilson (E), Sgt Merle H. Ruff (R), Sgt Robert W. Jarrett (TG) Stood down on mission 331 Flew on all of other the 2Lt Griffith missions. Completed 17 credited missions on 25 April 1945 (Mission 364). Sgt Walter B. Hogan (BTG). Stood down on mission 331. Flew on all other 2Lt Griffith missions. Flew on one mission with another Pilot (354). Completed 18 credited missions on 25 April 1945 (Mission 364). Sgt Roscoe L. Pearce (WG/Tog) - Flew on thirteen credited 2Lt Griffith missions: As Waist Gunner (332, 346). Crew Waist Gunner position deleted from crew and eleven credited missions flown as Togglier (348, 350, 351, 352(A), 355, 356, 357, 358, 360, 362, 363, 364). Flew on one mission with another Pilot (354). Completed fourteen credited missions on 25 April 1945 (mission 364). Mission #340 - 19 March 1945 to Plauen, Germany - Took several flak hits over the target causing loss of fuel from one of the wing tanks. Stayed with the formation as long as they could, but realized that they could not make it back to England. When approaching Belgium they dropped down to look for a suitable landing area. The area was heavily wooded, but came upon a river and found a grassy airfield and a crashed ME-109. Spotted a U.S. Army convoy on a nearby road which indicated that they were in friendly territory - it turned out that they were 7 miles from the battle lines. The airfield looked too soft so 2Lt Griffith made a wheels-up landing. There was major damage to the left wing and the rudder and the landing ripped the belly and bent the props, but the B-17 was otherwise intact. The B-17 was later salvaged. The eight crewmen were uninjured. The infantry convoy leader drove to the crashed B-17 and offered assistance. He drove the crew to the nearby city of Mezierres, where the crew was put up in a hotel for 3 days. The 8th AF Headquarters in Paris sent a truck to transport the crew to Lyons, where the crew was instructed to fly a repaired B-17G #43-38450 back to Molesworth. 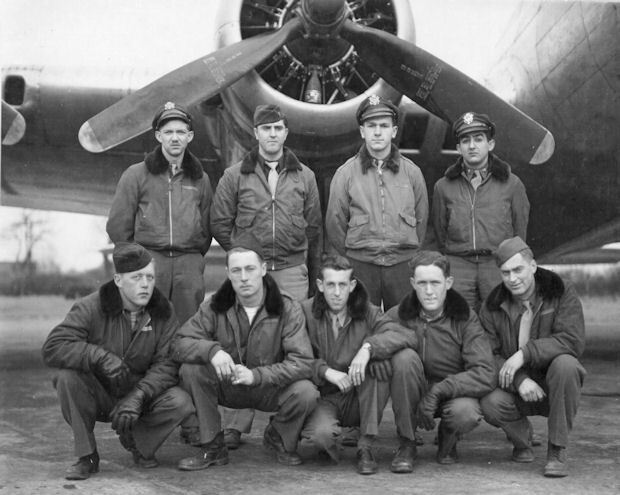 2Lt John L. Olson, from the Lt Joseph V. Leach crew, was a substitute CoPilot for 2Lt Lawrence S. Smith.